In February 2015, the band announced their signing with Napalm Records. The album was released in Europe on June 26 and in North America on July 10. This album was the first without early member and guitarist Brayden Dyczkowski. Right now, Canada has an incredibly vibrant metal scene going on. 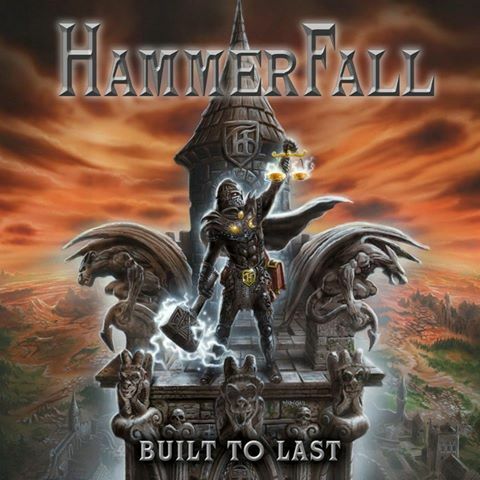 Power metal traditionalists are thundering the land along with NWOBHM revivalists. With a name that evokes medieval imagery and a sense of urgency, Unleash the Archers formed as a band in 2007 and has subsequently been developing a fanbase with the release of three full-lengths and one EP. 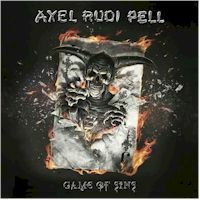 They've garnered enough attention recently to get a deal with Napalm Records for their newest album, "Time Stands Still". UtA generally play European-styled power metal with the familiar rapid guitar leads, double bass drums, and falsetto vocals. However, they aren't exactly your father's millionth clone of Helloween, HammerFall, and Gamma Ray. What separates them are their multi-layered vocals--melodic death growls and backing shrieks that often augment singer Brittney Slayes' lyric lines giving them a different kind of depth than purely harmonizing her. It's a hybrid approach with something for everyone and possibly a little too much for some. 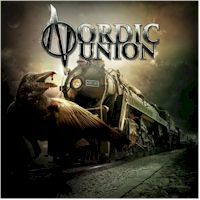 After a short instrumental intro, "Frozen Steel" leads us through the metal charge drawing inspiration from her fellow metalheads and the fictional warriors of the grand ice wall in George R. R. Martin's popular "A Song of Ice and Fire/Game of Thrones" series. Sci-Fi and fantasy are regular subjects for her lyrics (and the power genre in general). "Hail of the Tide" pulls from Scott Lynch' book "Red Seas Under Red Skies". Slayes really loosens up with "Tonight We Ride". After a brief minute in, hear her ascend up from her regular mid-range to stratospheric notes. She emphasizes keywords--"Don't tell me where to go. I won't give in this time." which later become "we", drawing us into the metal dialect of conformed rebellion and the recurring theme of taking chances to seek greater in the world. A "whoa-ooo-OOO!" section is in there that would make Mr. Dickinson himself smile. Perhaps the best example of breaking out, (also from their tendency toward conceptual songs), is "Test Your Metal", a straight-ahead, high octane wind-up with a guitar pedigree and gang chants descended from the 80s hard rock scene now dominated by European bands. I'd expect it to be a concert staple to get fists pumping between longer epics. It's a fantastic mid-point before moving into the darker touches of "Crypt" and the adversarial "No More Heroes". "Dreamcrusher" combines influences into the nine minute magnum opus of the album. Old school vocal reverb soothes you into a hair-raising moment of metal majesty then Iron Maiden triplets gallop into blistering alt-picking from the speed metal era and back again. "Going Down Fighting" bookends it as a rocker, but it's not quite as effective as the prior test of metal. Closing song "Time Stands Still" is a closer relative to Manowar with its manly chants and Native American rhythms sending us off to the final barbarian, or Viking, victory. On prior releases, Brittney sang as if she was vocalizing full tales of glory to a regal audience, a royal court storyteller maintaining a level of decorum. On "Time Stands Still" her singing is more passionate, more communal, and more alive. Throughout the release, Slayes is phenomenal. Her clean, banshee vocals are impeccable, her vibrato is tempered, and the screams and highs she hits are just jaw dropping. It's a performance worthy of a spot in the pantheon of power singers. Along with guitars that are recognizable and stellar, is the exceptional drum work which serves to add listening variety, often falling into half times and other rhythmic change-ups including moments, like blast beats, that are probably more for decoration than necessary song structure. The production could be crisper with more instrumental separation, but it's at about the level of the better independent bands. 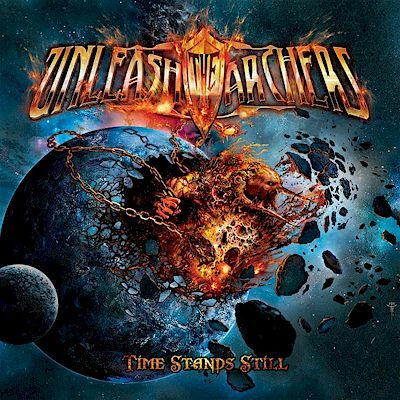 If you compare album covers put out by Unleash the Archers, "Time Stands Still" really does stand out. Muted grays and silvers of the past are traded in for a color scheme of rich blues and bright oranges. Their logo heats up to flames and a chained monster explodes out of the silent planet. It could be metaphoric for the band bursting forth onto a scene birthed almost thirty years ago. "Time Stands Still" is a hook-filled, majestic, hero's journey; a needed transfusion of fresh blood into the power genre.